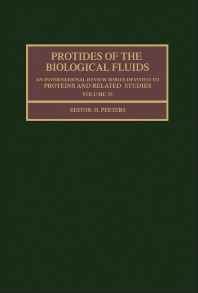 Protides of the Biological Fluids examines protides of the biological fluids and covers topics ranging from the use of DNA probes to diagnose inherited diseases and receptors to the conformation and function of biologically active peptides. This text has 115 chapters and begins by demonstrating the existence of gene families common to several vertebrates and which evolved by intragenic duplication. The chapters that follow focus on the use of DNA probes in the analysis of inherited disorders such as thalassemia and hemophilia. The reader is then introduced to receptors, especially for peptides. Receptors on circulating cells, hormone receptors, receptors involved in cancer, and immunoglobulin receptors are explored. The section on the conformation and function of biologically active peptides considers the methods including spectroscopic methods, crystallography, and theoretical conformational analysis. In particular, the use of synchrotron X-radiation in biological crystallography and of 2D NMR spectroscopy in the identification of folded structures in immunogenic peptides is highlighted. This book will be of value to biologists and biochemists. Which Method for "Microalbuminuria" In Diabetes Mellitus?